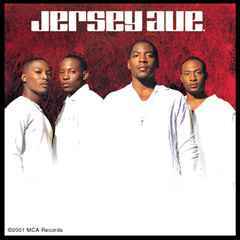 Jersey Ave. ‎– Jersey Ave.
℗©2001 MCA Records Santa Monica, CA 90404-U.S.A. Distributed by Universal Music & Video Distribution, Inc. This CD is the group's first album. The production is very hip-hop-influenced, Jersey Ave. doesn't inundate listeners with rapping. Romantic slow jams are dominant, although things get funkier on "Shorty" and "Tell Me Why".